This stunning piece of art is [Emily Velasco’s] take on the Atari Punk Console. It’s a freeform circuit that synthesizes sound using 555 timers. The circuit has been around for a long time, but her fabrication is completely new and simply incredible! With the experience gained from building that electrically simple brass frame, [Emily] then stepped up the difficulty for her follow-up project. It started with a sound synthesizer circuit built around a pair of 555 timers, popularized in the 1980s and nicknamed the Atari Punk Console. Since APC is a popular circuit found in several other Hackaday-featured projects, [Emily] decided she needed to add something else to stand out. Thus in addition to building her circuit in three-dimensional brass, two photocells were incorporated to give it rudimentary vision into its environment. Stimulus for this now light-sensitive APC were provided in the form of a RGB LED. 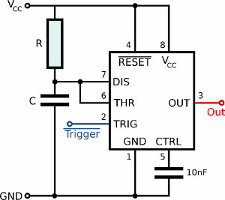 One with a self-contained circuit to cycle through various colors and blinking patterns. These two projects neatly bookend the range of roles brass rods can take in your own creations. From a simple frame that stays out of the way to being the central nervous system. 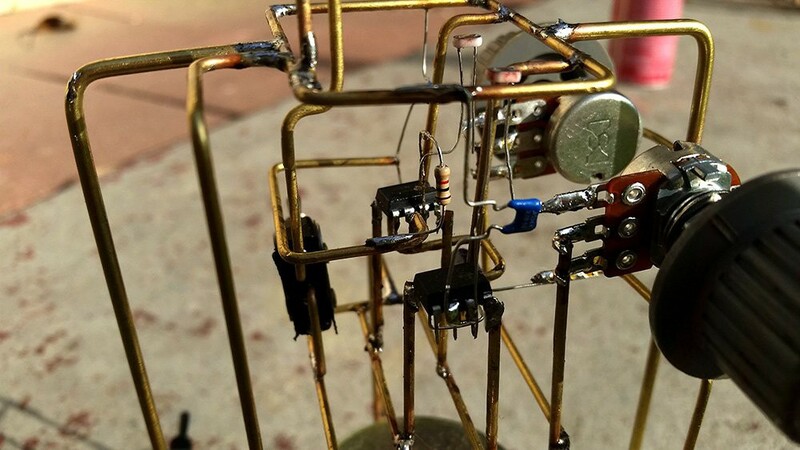 While our Circuit Sculpture Contest judges may put emphasis the latter, both are equally valid ways to present something that is aesthetic in addition to being functional. Brass, copper, and wood are a refreshing change of pace from our standard materials of 3D-printed plastic and FR4 PCB. Go forth and explore what you can do! Business cards are stuck somewhere between antiquity and convenience. On one hand, we have very convenient paperless solutions for contact swapping including Bluetooth, NFC, and just saying, “Hey, put your number into my phone, please.” On the other hand, holding something from another person is a more personal and memorable exchange. I would liken this to the difference between an eBook and a paperback. One is supremely convenient while the other is tactile. There’s a reason business cards have survived longer than the Rolodex. Protocols and culture surrounding the exchange of cards are meant to make yourself memorable and a card which is easy to associate with you can work long after you’ve given your card away. This may seem moot if you are assigned cards when you start a new job, but personal business cards are invaluable for meeting people outside of work and you are the one to decide how wild or creative to make them. “Dammit Jim, I’m a hacker, not a musician!”, to paraphrase McCoy Scotty from the original Star Trek series. Well, some of us are also musicians, some, like me, are also hack-musicians, and some wouldn’t know a whole note from a treble clef. But every now and then the music you want is in the form of sheet music and you need to convert that to something your hack can play. If you’re lucky, you can find software that will read the sheet music for you and spit out a MIDI or WAV file. Or, as with my hand-cranked music player, you may have to read just enough of the music yourself to convert musical notes to frequencies for something like a 555 timer chip. We’ll dive into both cases here. When [Kerry]’s son asked him if there was a way to make a mouse click rapidly, he knew he could take the easy way and just do it in software. But what’s the fun in that? In a sense, it’s just as easy to do it with hardware—all you have to do is find a way to change the voltage in order to simulate mouse clicks. [Kerry] decided to use the venerable 555 timer as an astable oscillator. He wired a momentary button in parallel with the left mouse button. 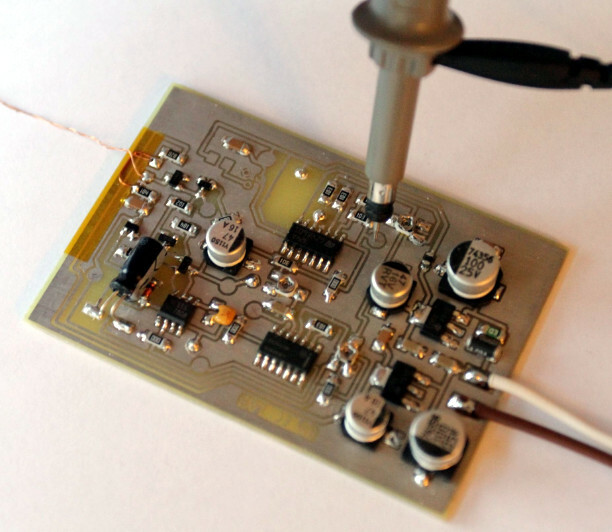 A 50k mini pot used as the discharge resistor allows him to dial in the sensitivity. [Kerry] found that he maxed out around 5 clicks per second when clicking the regular button, and ~20 clicks per second with the momentary button as measured here. The mouse still works normally, and now [Kerry]’s son can totally pwn n00bs without getting a repetitive stress injury. M1 your way past the break to check out [Kerry]’s build video. There are lots of other cool things you can do with an optical mouse, like visual odometry for cars and robots. Here’s an interesting implementation of a classic: the 555 timer as astable multivibrator for the noble purpose of making weird music. [pratchel] calls this a Morgenflöte or morning flute, indicating that it is best played in the morning. It would certainly wake up everyone in the house. Instead of using LDRs in straight-up Theremin mode and waving his hands about, [pratchel] mounted one in each of several cardboard tubes. One tube is small and has just a few holes; this is intended to be used as a flute. [pratchel] cautions against locating holes too close to the LDR, because it will overpower the others when left uncovered. A larger tube with more holes can be used as a kind of light-dependent slide whistle with another holey tube that fits inside. We were disappointed to find that the giant tube sitting by the amplifier hasn’t been made into a contrabass flute. Continuing the theme of astability, [pratchel] went completely solderless and built the circuit on a breadboard. The LDR’s legs are kept separate by a piece of cardboard. This kind of project and construction is fairly kid and beginner-friendly. It would be a good one for getting your musically inclined friends and family members into electronics. Here’s a 555 player piano built by Hackaday’s own [Steven Dufresne] that might be a good second step. Check out [pratchel]’s performance after the break.